Martin: I still don’t know what to do. I want to keep both my family and my business intact and I want to be true to myself at the same time. Ellen has worked for me for 15 years. We’ve grown very close. This isn’t just some cheap affair. Fran: Martin, we’ve been through this so many times. Your own daughter and I have known about this for years. Even if you don’t care about me, don’t you have any feeling for Margie? How can you go to work with her each day and carry on with another woman and expect Margie to work with her? You want to have your cake and eat it too. And what am I supposed to do, just condone it? Just continue to live the same way? Martin: We’ve changed, Fran, we’ve grown apart. My needs are different now. Ellen and I have a lot in common. We’ve shared so much time together through the business and about the business, and it just evolved into more than that. The kids are grown up now and Margie will just have to deal with it. Fran: You’ve got to make a choice, Martin, for all our sakes. Martin has struggled with his desire to juggle a “family” life with his wife and daughter, a “business” life with his daughter and Ellen, and a “personal” life with Ellen for many years. He acknowledges that he and his wife share few interests in common, beyond the growth of their children. His need to share more in life, especially a common interest in the business, is fulfilled by his relationship with Ellen. Martin is trapped in a lose-lose situation. While he may wish to retain his family relationship, he does not appear to see the impact that this has on his daughter in both their father-daughter relationship and in her ability to work with Ellen on a daily basis. Nor does he see the potential consequences on the business, should he decide to sever the relationship with Ellen. Fran’s and Margie’s years of silence have given Martin tacit permission to continue his duplicity, just as Martin’s failure to seek an alternative support system for his business concerns becomes a justification to share business concerns with Ellen. Fran expresses valid concern for her daughter’s ability to continue to work in a steamy setting and the attendant risk on the future of the business. Fran will no longer tolerate Martin having it both ways. Her own position at this time appears clear: it’s either Ellen or herself. 1. Couples need to discuss and openly survey the basis of their relationship. They need to frequently share a vision of their lives together, certainly no less than would partners in a business. 2. If one partner is drifting, or sensing the other is drifting, that needs to become an open topic for dialogue. Silence is unacceptable. Reconciliation may be possible but divorce cannot be ruled out. 3. The position of leadership in a family business is frequently a lonely one. There are all too few friends and associates in whom the leader can confide. Family business centers, trade associations and professional development organizations are preferable outlets to an inappropriate business confidant. 4. Boundaries must exist between family member principals and family business employees. A personal, and especially an intimate relationship between a principal and a non-family employee crosses a fragile barrier and puts both the family and the business at risk. 5. Margie needs to be able to separate her father from her co-worker in order to survive the day-to-day business. 6. Ellen may wish to seek alternative employment whether or not her relationship with Martin continues. This would simplify the work environment for Martin and Ellen while affording less distraction and greater comfort not only for Margie, but for other employees as well. 7. Martin’s wish to keep both his family and business relationships intact and without dramatic change is not realistic. Some professional counseling may help him understand that the status quo must cease and that he must make a decision, even if it means the sale of the business. Two generations ago, split families were rather uncommon. Now one estimate claims that sixty percent of all marriages occurring in the Nineties will end in divorce. While the fallout from family relationships always takes its toll on the family, it takes on a whole other layer of complexity when it happens in the family business. 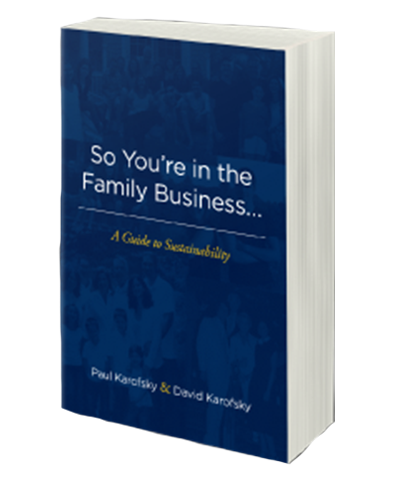 Paul Karofsky was president of his family’s third generation business. He completed graduate studies at Harvard University doing research in family communication styles. Paul is Executive Director Emeritus of Northeastern University’s Center for Family Business and facilitates its Leadership Development Forum. He is the Founder and CEO of Transition Consulting Group, Ltd and is a frequent speaker and resource to educational institutions worldwide. Paul consults to family enterprises and can be reached at Paul@fambizconsulting.com or 561-626-1110.